Could a tulip be a good place for hide-and-seek? Could a bit of dandelion fluff be a pillow? They could be, if fairies live nearby. This book invites kids to have a backyard adventure searching for the tell tale signs of fairies who might be residing all around them. Not only can children "search" for fairies in the book's unique blend of art and photography, but they will also be encouraged to discover the wonder and magic in nature, whether in a backyard or a local park. 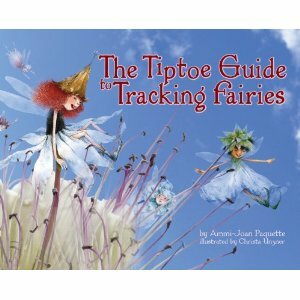 The Tiptoe Guide to Tracking Fairies is a perfect title for spring or summer! 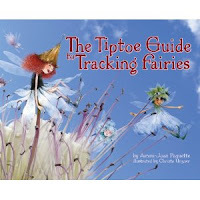 This book does a remarkable job of putting beautiful illustrations using real world pictures that we live in...it encourages young girls and boys to go on an adventure to find fairies! Not only can you imagine where the fairies are, but now you can see them! I just love books like this one...the combination of imagination, fairies and real life are all a child needs to have fun! I would recommend this book to any child, young and old! I will definitely be adding this book to my wish list :) If you would like to purchase this book, click on the title of the book (link) above to buy it on Amazon!